Are you passionately drawn to teaching women through their pregnancy, birth and transition into motherhood? The appleyoga approach to Pre and Postnatal yoga is an intelligent and grounded methodology that is easy to learn and teach. Set over 4+4 days this course is a 96hr YA accredited teacher training. 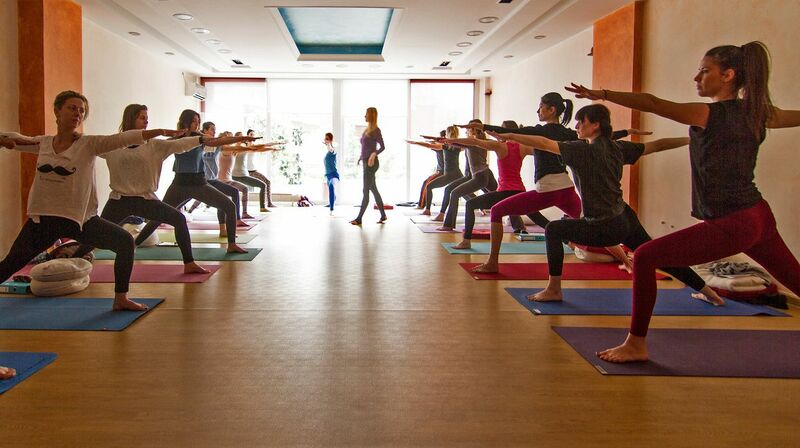 It provides a stimulating yoga education covering a comprehensive and relevant range of subjects. You will become empowered to skilfully guide women in this natural process and precious time of life. 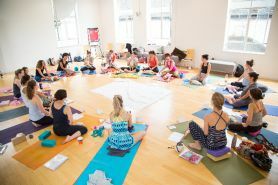 Learn to teach safe, effective, sensitive and uplifting classes, guiding women into the sacred landscape of their bodies, minds, and hearts, to connect with their babies and to embrace this new phase of their lives. Learn to empower women and tap into their psychological process giving them tools and the confidence to listen inside and make conscious choices for their life in pregnancy labour and motherhood. appleyoga's fully comprehensive prenatal training offers transformational yogic tools that provide safe, inspiring, nurturing and grounded support for women and their babies in pregnancy. Pregnancy is completely natural process and we focus on providing our teachers with a balanced understanding of the emotional and psychological journey into motherhood as well as the relevant and precise anatomy and physiology. This enables our teachers to guide women into their own intuition with integrity and awareness. As a prenatal yoga teacher trained with appleyoga it is vital to be able to create a consistent and supportive space for women at their most intense period of change in life. These classes offer women a time to come together and practice yoga with clear and confident teachers, that will form the basis from which they can embody their new roles in life with grace and clarity. Ready to teach full spectrum prenatal yoga classes with teaching skills in breath, relaxation, sound, contemplation and asana. Able to adapt a regular yoga class to support prenatal needs. Knowing how to adapt yoga asana for prenatal women and treating common ailments with in the class. With an understanding of how different cultures have viewed women in pregnancy and birth throughout the ages and why this is relevant to teaching yoga today. With fine-tuned teaching set of appleyoga pods, breath work, kriyas & more. A clear understanding of the 7 Spiritual Truths and how they inform a personal teaching style. An insight into the spiritual process of a teacher and how it allows us to hold the space for students with more integrity. appleyoga's postnatal training offers full spectrum yoga that can all serve to firm a foundation of physical emotional and spiritual health from which women can flourish as mothers and in all the roles they play. It can and often does take months for women to have re discovered their embodied strength and remembered who they are in the context of their new life. Practiced wisely, yoga can form the basis for this new exploration. This is a daunting time for new mothers and creating a class designed to support them on many levels can help them feel centred, give them a more positive outlook and provide access to simple tools to empower themselves throughout their day on and off the yoga mat. As well as supporting the mother, this training offers tools to incorporate the baby into classes. With a day dedicated to baby yoga and baby massage, you will have plenty to offer new mums, allowing them time on their mat with the baby. Baby yoga and baby massage have wonderful benefits for the development of a baby and it provides a wonderful time for the mother and baby to bond and enjoy a community support at this early stage of motherhood. Key principles of Yoga practices adapted for postnatal bodies. Yoga and Pilates apple pods designed to focus on re-establishing core strength, whole body realignment specifically the spine and pelvis and joint stability. Clear simple and safe ways to adapt a regular yoga practice for postnatal women to empower them. How to work with key ailments and complaints based on a grounded understanding of the anatomy and physiology of a postnatal body. Skills to offer baby yoga and ways in integrate this into a postnatal class. Skills on baby massage and ways this could be integrated into your yoga classes. You will be welcomed into the appleyoga teacher training community, a wonderful support network of gatherings, online resources, yoga education and like-minded spirits! Learning how to integrate within a postnatal class, baby yoga movements, massage and simply how to hold space for mama's with babies in the class. This is a complete teacher training and one cannot be completed without the other.